I love this time of the year. Spring has sprung! The mornings are getting lighter, and daylight saving has started. When I jumped out of bed this morning and pulled back the curtains I looked at the most glorious view down the valley and I was reminded that it’s exactly a year ago today since I first arrived at this beautiful home under Sanctuary Mountain. It would seem that season has nearly passed and we are moving on to bigger and better things. 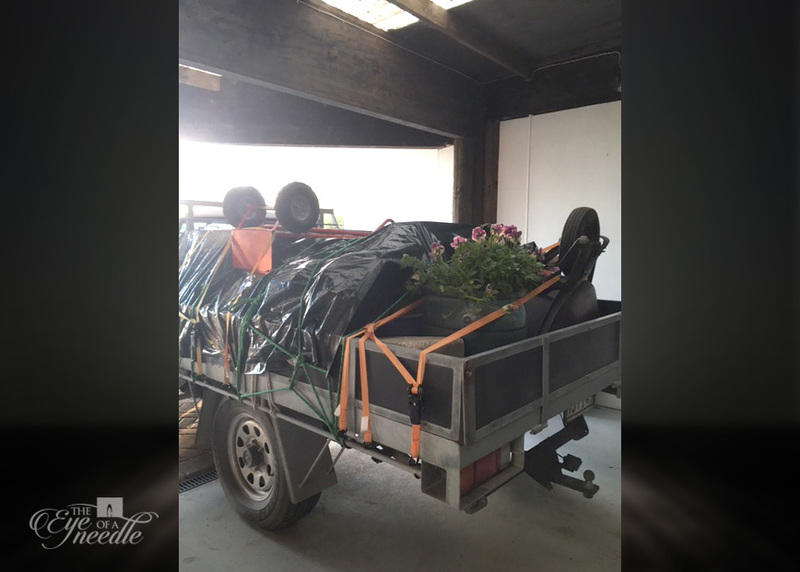 Over the weekend we took our first ute load of outdoor planter boxes and tubs and pots to our new home in Taupo. It was take over day for Liz, my dear friend and future ‘land-lady’on Friday. She has organized painters to come in this week to give her house a fresh coat of paint and the pink curtains will be coming down to be replaced with something a little more ‘earthy’. We got to see inside our next home for the first time, so now we can figure out what pieces of furniture will fit into this compact little 2 bedroom house, and what will need to go in to storage for the mean time. Until the time is right to find something more permanent that we can call our very own. This week marks Rosh Hashanah on the Jewish calendar, which is like New Year if you follow the ancient times and seasons. 5778 symbolizes New Beginnings, and for us that sure is relevant in this season. Everything is happening so fast we can hardly keep up! ‘A Man and his Van’ have been booked for Friday 6th October to help us pack and move. We still have a question mark over our 20 foot container, and what to pack in it. Do we pack all the ‘shop’ in the container and store it until we find our physical shop in Taupo? And where DO we store this container – we know it can’t sit on the front verge of our new rental for too long. What do we leave out to pack in the second truck, because not everything will fit in to the container…what might we need there that we don’t need here, and vice versa? So many questions…that we don’t yet have the answers to, and yet there is a peace hovering over us assuring us not to worry and to just take one step at a time. We’ve had another slight change of plan this week, and this is one of the reasons why we are learning to hold everything lightly. As some of you already know, my love has been dealing with a heart condition for the past few months, and some days are a bit of a struggle, which is why he has been unable to hold down a proper job. Before we went to China, his cardiologist told us that while we were away there was to be a cardiology conference in Hamilton. My man’s condition would be used as a ‘case study’ so when we arrived back from our month away, a verdict on what to ‘do’ with this normally fit, 50 something man with a dicky heart, would have been made. Last week we met with the heart surgeon. He came straight out with ‘ You need an operation’ and ‘That operation needs to be sooner rather than later!’ In fact, probably in the next 2 weeks, as soon as the paperwork and the queue can be sorted at the hospital. So our plans to move to Taupo and ‘settle’ before the heart surgery have been altered slightly. We know that recovery from heart bypass surgery will take 2-3 months, and so it’s important to not overdo anything, both before and after surgery. We both had a feeling that things were going to move fast, and in a sense we have been preparing for that for the past couple of weeks. We still don’t have the official date for surgery, but it’s most likely going to be before we move house. It would be nice to get 5 days notice, but if the door opens sooner than that then we know that our fast- tracking-favour just gathered a bit more momentum! Looking back, I am reminded that I’m becoming a bit of an expert at moving house, having done it 4 times in the last 5 years, by myself. If the worst case scenario happens and my man is in hospital on moving day, I know there are people out there that will help me to move from A to B without too many dramas. It’s amazing once you put your mind to it, how quickly you can pack up a room, and clean around the skirting boards. We are pretty tidy people, and it’s not like we have too many years of stuff accumulated that needs packing any more. In fact every time I move I am becoming more minimalistic. Woah! Healing prayers and love and more meaning to that word God Speed!